The Chemawa Indian School is an accredited high school in the mid-Willamette Valley north of Salem. It is one of four remaining off-reservation boarding schools funded and operated by the Bureau of Indian Education. Most of the students come from reservations and communities in the western United States. OH Planning & Design Architects, authorized by the Chemawa Indian School and Emerick Construction, commissioned Counsilman-Hunsaker to provide a swimming pool audit in the spring of 2012. The swimming pool was originally constructed in the 1970s. Improvements have been made to the pool and mechanical systems over the years with the most significant renovation in the early 2000s. The audit included the evaluation of the current condition of the pool and identified design or equipment deficiencies. The final report detailed the existing condition of the pools and its equipment including life expectancies. Recommendations were made for short-term and long-term repairs or replacements which included cost estimates. 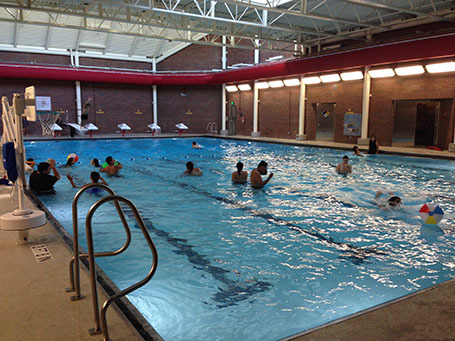 In August 2012, Chemawa Indian School decided to move forward with the renovation of the swimming pool and replacement of all mechanical room equipment. The renovation included the addition of new depth markers, grab rails, stanchion posts, starting blocks, main drains, 1-meter diving board, pool lift, and underwater lighting. The entire mechanical room was replaced with new pumps, filter, chlorine system, acid system, heater, chemical controller, fill funnel, UV, and water level controller.